Includes Full conference pass to all startup sessions, workshops, fireside chats, pitch sessions with investors, startup competition, award ceremony and closing ceremony, Startup EXPO, Live interviews. Complimentary breakfasts and lunches on both days, closing wine reception, unique networking opportunities, and especially brewed-for-you coffee through both the days. Limited Access: 2 Days pass to Exhibit Hall and Pitch Competition starting at 2PM. Includes access to Expo, Startup Pitch Competition, Award Ceremony and Cheese and Wine reception on October 14th! 3Ft round table in the general location, inside the conference room fully equipped for EXPO purposes. The Ticket includes 2 full standard conference passes and VIP Dinner. If you have a ticket and want to add VIP Dinner with Investors, Speakers and Organizers get this Ticket. VIP Dinner is on Oct 13 at 6PM. If you have an EXPO table, this is included. 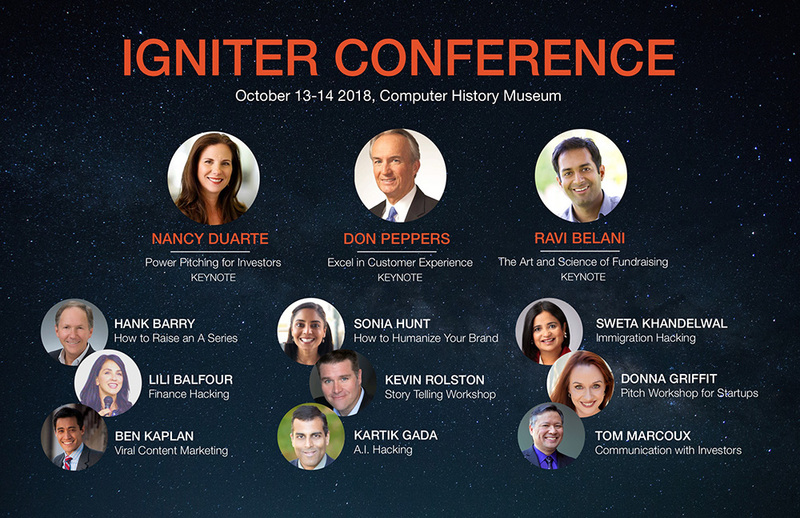 Igniter International Conference 2018 brings a unique opportunity for Startups around the world to meet Silicon Valley investors. Our theme this year is "Invest in Future". Join us for two days of fund raising with top investors in Silicon Valley. 14 Startup Sessions and Workshops: Learn Startup trends on Marketing, PR, Legal, Branding, Finance and Immigration topics from Industry Experts. Participate in workshops for Leadership, Team building, Pitching and Communication. 40+ Investors and 2 Expert Panels: Learn from Silicon Valley experts on AI, Blockchain, Robotics, Enterprise and Consumer Products. 28 Startups and 4 Pitch Competitions: Join us at our biggest Pitch Competition in front of 40+ investors in the Silicon Valley with four dedicated tracks on AI, Blockchain, Enterprise and Consumer products.